If you’ve seen it once, you will never forget it- the surreal sight of marionettes moving realistically through thoroughly unreal worlds in shows with titles like Supercar, Thunderbirds, and Captain Scarlett And The Mysterons. Developed by Gerry Anderson from ’60-’69, these science fiction shows electrify the imagination and, with a willing suspension of disbelief, tell intricate stories beyond what many shows today can seem to pull off with real actors. What’s the one thing that you want those interested in Supermarionation to understand? That every single item you see on-screen had to be handmade for the films. There were hardly any items that could be used as-is, in the correct scale without at least some customization. Think about it – every garment, hand prop, piece of furniture… literally an entire world had to be created. In many cases, items had to be duplicated in more than one scale. The amount of craftsmanship required was pretty staggering. 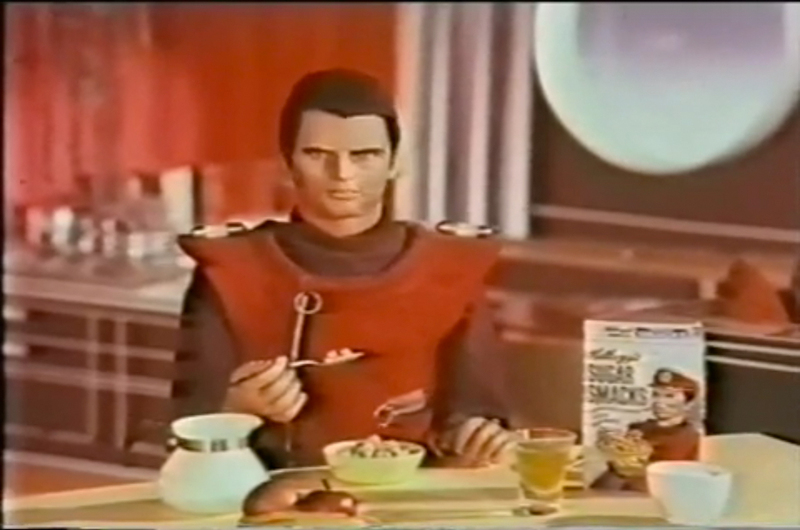 Is there anything in the modern entertainment landscape that you would consider the equivalent of Supermarionation? The closest thing would be Team America: World Police. Matt Stone and Trey Parker started the project talking about how much respect they had for Gerry Anderson and his team, but by the end of the shoot they declared him to be crazy for making more than one puppet series because of the difficulty involved in getting marionettes to do anything filmable within a reasonable time frame. I was lucky enough to visit the set of Team America (they were shooting the bit where the Sphinx’s head gets blown off that day), and it was a blast seeing all the sets and miniature environments strewn around the stage. The entire movie was shot in a smallish light industrial warehouse in Los Angeles. Your book on Mike Trim is loaded with information and rare photos. How difficult was it to produce? Not too difficult, really. Mike had already put some of his memories and thoughts on his experiences down on paper before I approached him about the book. I was able to adapt some of that material into the finished narrative in about a month, along with information collected from interviews I did with him. Mike still had a group of artworks from the Century 21 era as well as many illustrations created afterwards which we had shot by a photographer near where he lives. Many of the other illustrations come from my (or other fans’) collection, the Fanderson archive (the official Gerry Anderson fan club, online at http://www.fanderson.org.uk), or from Mike and a few of his former co-workers. The images from Jeff Wayne’s Musical Version of The War of the Worlds were provided under license by Wayne’s company. The foreword and afterword by Weta Workshop’s Sir Richard Taylor and David Tremont took a few weeks, they were both very excited to contribute. Once all the materials were gathered it was a pretty quick job to get them all formatted and off to Hermes Press for publication. It must have been a joy to work with one of your heroes. How did you first meet Mike Trim, and what was it like to work with him? It really was! I was first exposed to Mike’s design work as a kid, I collected the Dinky diecast toys from the Anderson television shows. He designed the SHADOmobile from UFO, the Maximum Security Vehicle and Spectrum Saloon Car from Captain Scarlet, and a few others in the line. I found a mutual friend selling an original pencil drawing by Mike on ebay and asked him to put me in touch so I could commission a piece for myself, and that was my first experience with Mike. I had him do a color pencil rendering of the SHADOmobile, which appears in the book. When The Future Was FAB was released, Mike and I appeared at the Fanderson “Sector 25” convention in England to promote it and sign copies. That was an amazing weekend, and one of the most rewarding experiences I’ve had as an author. He has become a very treasured friend and I’m so happy to have had a hand in getting the word out to the world about his incredible talent, and his great stories of creating such iconic science fiction imagery. Have you ever had a go at creating special effects yourself? Only when I was a youngster. I made a lot of Super 8 sci-fi epics, lost now to the sands of time. But I’ve always appreciated the people who created cinematic illusions, and been interested in finding out how they achieved such spectacular results. It’s been a privilege to spend so many years writing about them in magazines like Famous Monsters of Filmland, Fangoria, SFX, FilmFax, Effects Special, and many more. Your new book, Arctic Adventure!, is officially licensed fiction based in the Thunderbirds universe. When you wrote it, did you imagine marionettes in action, or something more or less abstract? I imagined the characters as humans, but still visually coherent with the original Thunderbirds universe. They’ve always seemed pretty human to me while watching the series, even with all the limitations imposed by using stringed puppets, so it wasn’t much of stretch. The story is focused on Brains and his backstory and rescue take center stage in the book. In fleshing out the character, I think I would have done him (and the reader) a disservice if I saw him in my mind’s eye as anything less than a real person. For more information including how to order Arctic Adventure!, go to my website at http://Taylorcosm.com.